While I sometimes make ice cream during the colder winter months, I really kick my ice cream-making into high gear once spring rolls around. I feel like I’ve made so many ice cream recipes, but my list of recipes I want to try continues to grow. That means you can expect a healthy dose of ice cream recipes featured here throughout the next few months. Readers often ask if they can still make homemade ice cream even if they don’t have an ice cream maker. The answer is yes! In fact, I put together a tutorial on how to make homemade ice cream without an ice cream maker a few years ago. Be sure to check it out if you’re ice cream maker-less. 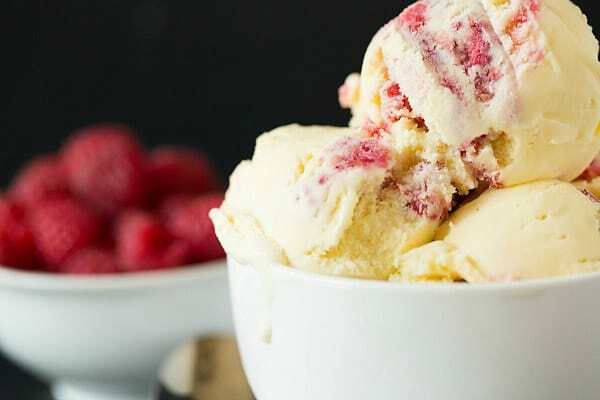 Now, on to this fabulous ice cream… a traditional vanilla ice cream base is augmented with white chocolate and then layered with a fresh raspberry swirl. I’m not big on white chocolate all by itself, but when combined with a complementary flavor like raspberry, it’s simply irresistible. You can make the raspberry swirl as thin or chunky as you’d like. The way the recipe is written leaves chunks of raspberries in the ice cream (which I love), but if you’d prefer to strain the seeds out or have a smoother swirl, simply press the mixture through a fine-mesh strainer before layering it into the white chocolate ice cream. You’ll notice that there is vodka in the raspberry swirl ingredients; the alcohol keeps the swirl from freezing completely and becoming icy. You can omit it, but know that the texture of your raspberry swirl may be a bit compromised. 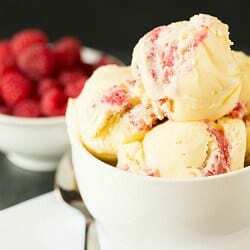 I love the mellow smoothness of the white chocolate ice cream, and the punch of flavor that the raspberries give it is absolutely perfect. Have you churned up any good ice cream lately? Any requests for this summer? 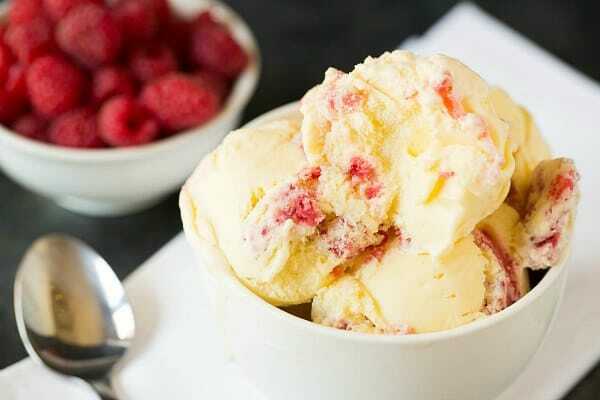 A wonderfully creamy white chocolate ice cream with a raspberry swirl. Make the Custard: Place the chopped white chocolate in a large bowl and set a fine-mesh sieve over top of the bowl. Combine the milk, sugar and salt in a medium saucepan and place over medium-low heat, stirring occasionally, until the sugar melts. Meanwhile, whisk the egg yolks together in a medium bowl. Slowly pour the milk mixture into the egg yolks, whisking constantly, then scrape the mixture back into the saucepan and place over medium heat. Stir the mixture constantly with a rubber spatula until the custard thickens and coats the back of the spatula (it should be between 170 and 175 degrees F on an instant-read thermometer). Pour the custard through the strainer and stir the mixture until the white chocolate is completely melted. Stir in the heavy cream, then stir in the vanilla extract to combine. Place the bowl in an ice bath and stir occasionally until the mixture is cool. Cover and chill in the refrigerator at least 8 hours, or overnight. 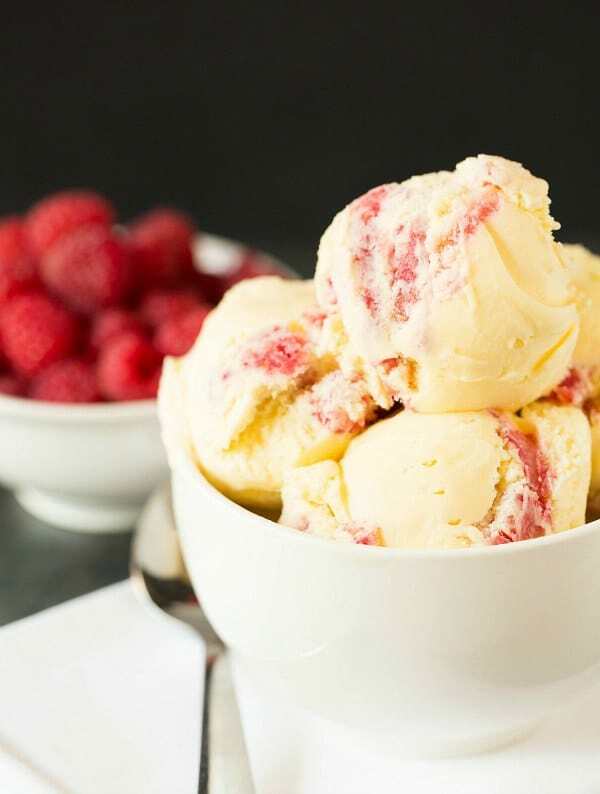 Make the Raspberry Swirl: An hour before you're ready to churn the ice cream, combine the raspberries, sugar and vodka in a small bowl and mash with a fork until juices are released but large chunks still remain. Cover and place in the refrigerator to chill until needed. Churn the Ice Cream: Freeze the ice cream custard in an ice cream maker according to the manufacturer's instructions. As you remove the ice cream and place in a freezer-safe container, layer it with spoonfuls of the raspberry swirl mixture. You'll notice that there is vodka in the raspberry swirl; the alcohol keeps the swirl from freezing completely and becoming icy. You can omit it, but know that the texture of your raspberry swirl may be a bit compromised. Love white chocolate and raspberry together! Is there a brand of white chocolate you prefer? I find white chocolate hit-or-miss. Hi Nicole, I use either Ghiradelli or Valrhona white chocolate. This has been on my must/make list for a while. When I had some leftover yolks and white chocolate on hand, I decided it was time I tried it. I used the Ghiradelli white chocolate. This ice cream recipe is straight-forward and SO amazing! I’ve made a lot of ice cream over the years. This may be the best one! I will definitely be making it again. Thank you for a wonderful recipe. This is a great recipe, I know because I’ve made it using Lebovitz’s The Perfect Scoop ice cream recipe book! 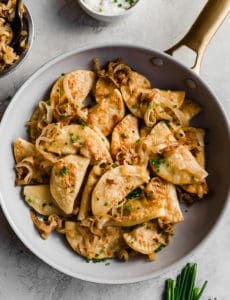 I think you need to cite Lebovitz as the source of this recipe. Otherwise it’s like you’re stealing his work and trying to pass it off as your own. It is cited, please see the bottom of the recipe. Hello! Can you substitute the vodka for some non alcoholic like lemon? Hi Noelle, The alcohol in the vodka actually helps to keep the fruit swirl from becoming icy. If you need to omit the vodka, there is nothing to replace it with that have the same properties, so you can just leave it out and know that the raspberry swirl might be a tad icy. I am not sure what you mean? Yes, you need to make the custard on the stove-top. you don’t need to strain the raspberries? they aren’t too seedy? Hi Jill, No, I didn’t think so, however you can strain them if you prefer something totally smooth. Hi Michelle, can I sub tequila for vodka? it’s good that i whipped the cream. they are amazing. DELICIOUS!!! Thank you for the lovely recipe. Absolutely wonderful!! My husband even said it was a winner. Sorry for the typo……Meant may I use frozen raspberries. May I used frozen raspberries? I think that would be okay. Just be sure to thaw and drain them first. Can you taste the Vodka in the final product? Ohhh, this looked so yummy, I had to whip up a batch this morning! I love when you find an amazing looking recipe and you just happen to have all of the ingredients on hand (including raspberries fresh from the garden)…Mmmmmm. In place of the vodka for the swirl, I used a raspberry liqueur, Chateau Monet. I hope the switch works out for me. I’m about half an hour away from churning, but my mouth is watering already. Thanks for the share! I made this ice cream for a party this weekend. I got a lot of “best ice cream ever”. thanks for another great recipe. Okay. I made this today. So good. How did I miss this earlier? I was just cleaning out my mess of an inbox and came across this gorgeous photo that was calling my name…really loudly! Wow…you’ve got me thinking of breaking out my ice cream machine right now! This sounds amazing! Such a wonderful, creamy ice cream! 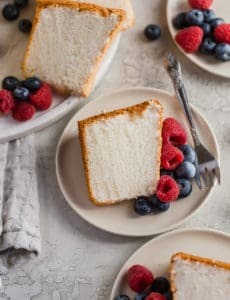 Could you substitute blueberries or blackberries for the raspberries? Hi Laura, I think you could definitely substitute any other berries! This looks perfect. I can’t wait to have a taste of this. I want this so dang much right now! Amazing! You’re totally inspiring me to dust off my ice cream machine!